Hurricane Sandy currently has a lot of people in the Northeast frantically making last minute preparations for the storm. As planners, we’d prefer to ready ourselves for possible inclement weather before it is ever an issue. In order to help prepare for future weather-related emergencies, we’ve put together a list of must have items. 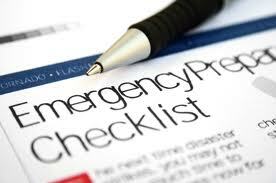 This checklist was developed in part from the emergency preparedness lists of FEMA and the CDC, as well as our own recommendations. Household chlorine bleach, which you can use as a disinfectant to clean surfaces (mix nine parts water to one part bleach). In an emergency, you also can use it to purify water. Use 16 drops of regular household liquid bleach per gallon of water. We encourage all of our readers to work on putting together their emergency supply kit as soon as possible. You never know when it might become needed. And visit Ottawa Coast2Coast trainings.